Before the War on Drugs cast its shadow across humanity, a collective mind expansion was being achieved in part thanks to cannabis and psychedelics. For decades the military-corporatist state has suppressed the human right to ingest “illicit” substances – while profiting from this prohibition – but the pursuit of knowledge has a way of thriving despite fascism. While research on the medicinal uses of cannabis has increased at a tremendous pace, therapeutic research into psychedelics has also garnered more interest in recent years. In 2014, advanced cancer patients “experienced immediate and dramatic reductions in anxiety and depression, improvements that were sustained for at least six months” with a single dose of psilocybin (the “magic mushroom” active ingredient). Addiction, too, can be treated with psychedelics. Psilocybin has a far better success rate at helping people quit smoking cigarettes than any nicotine-replacement therapy. As one study participant said, “Smoking seemed irrelevant, so I stopped.” This comes as no surprise; in the 1960s and 70s LSD was being shown to help people overcome alcohol addiction. Now, as the opioid epidemic rages in America, psychedelics are again telling us they can help. Researchers analyzed “44,000 illicit opioid users” from a six-year timeframe, finding a “pervasive and significant” association between psychedelic use and decreased opioid misuse. The authors note that their results are consistent with other studies showing psychedelics can treat substance use disorders. What makes this study so glaring is the fact that it is based on six years of data from the federal government’s own National Survey on Drug Use and Health (NSDUH), which surveys 70,000 people each year. How ironic that two drugs deemed illegal by the federal government – cannabis and psychedelics – clearly help people overcome addiction to legal opioid drugs and heroin. As we reported in August 2015, a major study showed that deaths from prescription painkillers plummeted in states with legal cannabis. Other studies confirmed that the use of prescription pills drops in states with legal cannabis, which explains why big pharma fights against cannabis legalization. Clearly, there’s something about psilocybin and LSD and cannabis which, when taken responsibly, can allow a person to break free from strangleholds on life. These are some quotes from people in clinical trials taking psychedelics, and the last one is from an atheist. 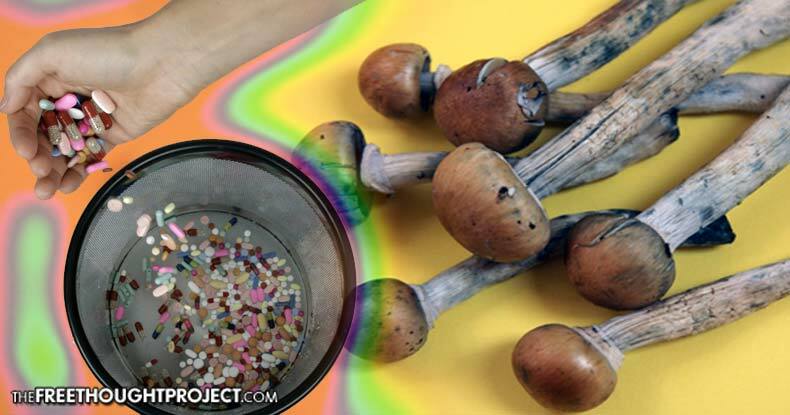 The mystical experience of psilocybin described by patients can be thought of as the opposite of PTSD, where a single event has a lasting negative effect on the mental state. Functional magnetic resonance imaging (fMRI) is helping to understand the mechanisms of how psychedelics can treat addiction and depression. Stimulation of serotonin 2A receptors by psychedelics decreases activity in certain areas of the brain, especially the “default mode network” (DMN) which is involved in our ingrained thought patterns and behaviors. Decreasing DMN stimulation can allow people to break free from destructive brain patterns. Fascinating research using fMRI shows that, under the influence of psilocybin, the brain enters a pattern of activity similar to the dream state. Primitive areas of the brain linked to emotions, memory and arousal become more synchronized, while higher-level thinking and the “sense of self” become unsynchronized. As long as the nonsensical War on Drugs continues to be waged by government, the power of psychedelics to free people from opioid addiction and numerous other mental ailments will remain out of reach for millions.